The earned income tax credit (EITC), first proposed in the early 1970s, was signed by President Ford. It was later substantially expanded by President Reagan, who deemed it “the best anti-poverty, the best pro-family, the best job creation measure to come out of Congress” (Snyder 1995). However, in recent years, the EITC has often come under political attack. It is criticized (sometimes implicitly but often explicitly) because it eliminates the income tax liability of many low-income workers, thus, it is claimed, giving them no “skin in the game” in support of the common good.1 Others criticize it for redistributing income to “people who have never paid a dime in their lives” but nevertheless “get a check from the government” (Sandmeyer 2013). Both the EITC and the CTC were initially proposed, supported, and expanded by Republican policymakers with broad bipartisan support. Claiming the EITC and CTC can be complicated and involves filing additional tax forms, which leads to errors of both over- and underpayment. The EITC appears to increase the labor force participation of single mothers, yet the high marginal tax rates associated with its phase-out range do not appear to have a significant work disincentive effect. The EITC is, by far, the most progressive tax expenditure in the income tax code. The EITC reduces poverty significantly, with children constituting half of the individuals it lifts out of poverty. The EITC and CTC are effective in increasing after-tax income of targeted groups, reducing poverty, and reducing income inequality. The primary purpose of taxes is to fund government to meet various social and economic goals regarding national security, economic stability, income distribution, poverty alleviation, and the efficient allocation of resources. The activities directed to lower-income individuals and families typically involve grants or transfer payments, which are often means-tested. Means-tested grants are fairly effective in reducing poverty but can potentially create work disincentive effects. Tax expenditures are also frequently used to meet many of the same social and economic goals.2 Overall, tax expenditures benefit taxpayers at all income levels, but they raise the after-tax income of higher-income taxpayers more than that of lower-income taxpayers (see, for example, Toder and Baneman 2012). The earned income tax credit (EITC) and the child tax credit (CTC) are two tax provisions targeted to low- and moderate-income taxpayers. The EITC encourages work among low-income individuals. 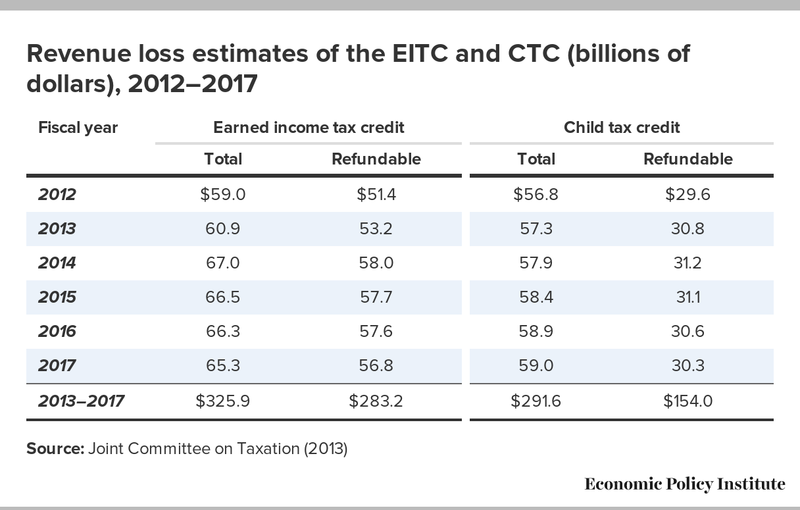 Both the EITC and the CTC significantly reduce taxes on low- and middle-income families with children. Tax credits differ from other tax expenditures in that they directly reduce income tax liability, rather than indirectly through reducing taxable income. That is, $1 of a tax credit reduces tax liability by $1. A tax deduction of $1 will reduce taxable income by $1, but reduces tax liability by the marginal tax rate times $1. For example, an additional $1 of deduction for a taxpayer in the 10 percent tax bracket reduces tax liability by 10 cents; a taxpayer in the 39.6 percent tax bracket would have her tax liability reduced by 39.6 cents. The EITC and CTC differ from most other tax credits in that they are partially or fully refundable. With a refundable tax credit, if a taxpayer were to have $100 in tax liability and $200 in a refundable tax credit, then he would receive a tax refund of $100.3 The EITC and CTC are similar in that the amount of the credit depends on the number of qualifying children and earned income. The EITC was enacted during the Ford administration by the Tax Reduction Act of 1975. Originally, the EITC was supposed to be a temporary refundable tax credit for lower-income workers to offset the Social Security payroll tax and rising food and energy prices. The credit was made permanent by the Revenue Act of 1978. The EITC was considered both an anti-poverty program and an alternative to welfare because it incentivized work (Ventry 2000). The EITC is work-oriented in that the amount of the credit is based on earnings. Earnings include wages and salaries as well as self-employment income, but do not include income that is not connected with employment (e.g., interest, dividends, capital gains, and income from social welfare programs). The amount of the credit first increases as earnings increase, reaches a plateau, and then falls as earnings increase. For example, for a couple with two children (see the third data column in Table 1), the credit is equal to 40 percent (the credit rate) of the first $13,090 in earnings. The maximum credit of $5,236 is received by taxpayers with earnings between $13,090 and $22,300. The credit phases out at a rate of 21.06 percent (that is, it is reduced by 21.06 cents for every additional dollar of earnings) for earnings over $22,300 and is zero for taxpayers with earnings over $47,162. The child tax credit was enacted as part of the Taxpayer Relief Act of 1997 as a $400-per-child credit (which increased to $500 for tax years after 1998) and accounted for over 60 percent of the 10-year cost of the entire bill (Joint Committee on Taxation 1997). The origin of the credit can be traced to a proposal for a $1,000-per-child tax credit by the 1990 National Commission on Children (1991). A less generous credit ($500 per child) was proposed by the House Republicans of the 104th Congress in the 1994 “Contract with America” (Steuerle 2004); this lower amount was the basis for the tax credit created three years later. The child tax credit had broad bipartisan support. It was eventually increased to $1,000 per child as part of the 2001 and 2003 Bush tax cuts. The CTC allows a nonrefundable credit against income taxes (including the alternative minimum tax) of $1,000 per qualifying child under age 17. The credit begins to phase out for married taxpayers with adjusted gross income (AGI) above $110,000 ($75,000 for single taxpayers) at a rate of $50 for each $1,000 that AGI exceeds the threshold. The credit is partially refundable (the refundable portion is called the additional child tax credit). To the extent that earned income exceeds a given income threshold ($3,000 in 2012) and the nonrefundable credit exceeds tax liability, an amount of up to 15 percent of the excess earnings (with a maximum of $1,000 per child) is refundable. 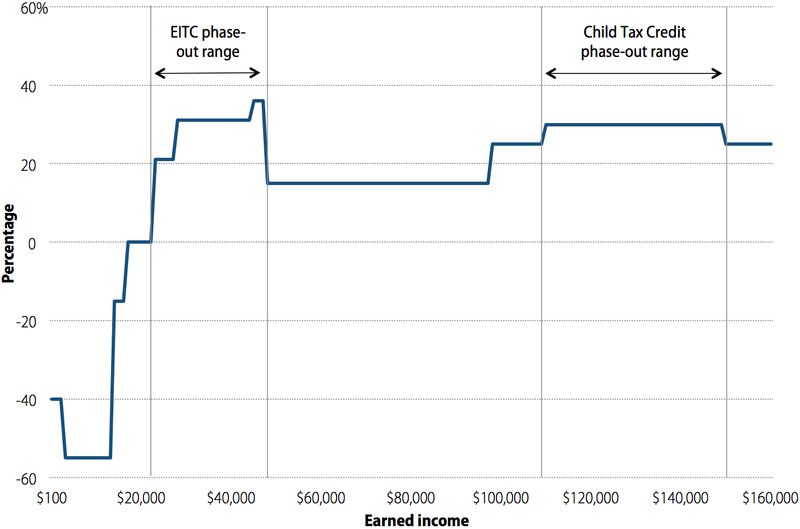 Unlike the EITC, the child tax credit is not targeted to just lower-income taxpayers. A married couple with two qualifying children can receive the child tax credit with AGI up to $150,000 (an income level that puts them in the top 10 percent of the income distribution). In fact, the limits on the additional child tax credit cap the refundable portion of the credit for the lowest-income taxpayers, but usually not for middle-income taxpayers. In addition, the CTC is a fixed per child amount and thus does not take into consideration economies of scale within the family. These provisions are available to taxpayers at all income levels, but the benefits of some may be limited for the highest-income taxpayers by other tax provisions. The first three provisions are considered part of the normal income tax system and, therefore, are not considered tax expenditures. Furthermore, these three do not depend on the taxpayer’s employment status or on earnings. The last provision, the child and dependent care tax credit, is contingent on employment and earnings, and is considered a tax expenditure. Exemptions for the taxpayer have been in the tax code since the beginning of the individual income tax. The additional exemption for dependent children was added by the Revenue Act of 1917 ($200 for each dependent under age 18). Taxpayers are allowed exemptions for themselves and dependents ($3,800 per personal exemption in 2012) in calculating taxable income. Exemptions do not affect tax liability in the same way that tax credits do. Instead, exemptions reduce taxable income, and their effect on tax liability depends on the taxpayer’s tax bracket. For example, a taxpayer in the 10 percent tax bracket receives a $380 tax reduction for each personal exemption, whereas a taxpayer in the 25 percent tax bracket receives a $950 tax reduction per personal exemption.6 Personal exemptions combined with the standard deduction protect a minimal amount of income from taxation, often eliminating income tax liability for many lower-income individuals and families. Since 1976, working taxpayers have been able to claim a nonrefundable tax credit for employment-related care expenses for children and other dependents. The maximum credit is 35 percent (the credit rate) of $3,000 for one qualifying child ($1,050) and of $6,000 for two or more qualifying children ($2,100). The credit rate is reduced as AGI rises (the minimum credit rate is 20 percent). Most taxpayers claiming the credit receive less than the maximum amount of the credit. Since this credit is nonrefundable, working taxpayers with no tax liability cannot claim the credit. Both the EITC and CTC reduce the tax liability of eligible taxpayers and, consequently, reduce tax revenue. The Joint Committee on Taxation (2013) estimates that the earned income tax credit reduced federal tax revenue by $59.0 billion in fiscal 2012 and will reduce tax revenue by $325.9 billion between fiscal 2013 and 2017 (see Table 2). The forgone tax revenue from the child tax credit is estimated to have been $56.8 billion in fiscal 2012. In comparison, fiscal 2012 outlays for the main federal family assistance program—Temporary Assistance for Needy Families—was $16.1 billion, while outlays for food stamps (now called the Supplemental Nutrition Assistance Program) were $80.0 billion. In contrast, forgone tax revenue from two tax provisions primarily benefiting higher-income taxpayers—the exclusion of pension contributions and earnings, and the reduced tax rates on capital gains and dividends—amounted to over $200 billion in fiscal 2012. Adam Smith’s The Wealth of Nations (1776) introduced the convention of evaluating tax provisions on three criteria. The first is simplicity and convenience—the provision should be clearly stated, not arbitrary, and minimize the inconvenience of filing the tax return. The second criterion is efficiency—the extent to which the provision adds or removes economic distortions. Whether or not a tax incentive achieves its objective, such as increasing work effort, can be considered a question of efficiency. Lastly, a provision should be judged on equity—how the benefit or burden of the provision is distributed among taxpayers, and how it changes the distribution of the overall tax burden. As Congress has increasingly used the tax code to pursue policy goals, tax returns have become longer and more complex. Taxpayers claiming the EITC and CTC must file either Form 1040 or Form 1040A.7 Form 1040 is a two-page, 77-line tax form with a basic instruction booklet of 108 pages.8 The simpler Form 1040A is a two-page, 46-line tax form with a 96-page instruction booklet. A taxpayer claiming the EITC must file the six-line Schedule EIC (providing information on the qualifying children) with her tax return and calculate the amount of the credit using a six-line worksheet. Claiming the CTC involves filing the 13-line Schedule 8812 (for the additional child tax credit) and calculating the credit using a 10-line worksheet. The Internal Revenue Service (IRS) also produces a 60-page publication to explain the EITC (Publication 596) and an 11-page publication to explain the CTC (Publication 972). This paperwork burden entailed in claiming the EITC and the CTC is mitigated somewhat by the use of paid tax preparers or volunteer tax preparers, and electronic tax return filing. Almost 80 percent of taxpayers filing the 1040 or 1040A filed electronically in 2010, and 60 percent used a paid or volunteer tax preparer (IRS 2012). In a recent report, the Treasury Inspector General for Tax Administration (2013) noted that 20 percent to 25 percent of EITC payments are improper. Earlier studies have estimated similar improper payment percentages (for example, IRS 2002). However, EITC noncompliance studies have shown that the most common errors leading to overpayments involve unintentional misreporting of qualifying children (McCubbin 2000; IRS 2002). Furthermore, the noncompliance studies do not take into account underpayments. McCubbin (2000) cites estimates that up to 20 percent of eligible taxpayers fail to claim the EITC. It is easy to understand how these unintentional errors occur. The criteria for qualifying children vary among different tax provisions. The IRS (2013) has prepared a three-page table listing the qualifying child criteria for the EITC, CTC, dependent exemption, head of household filing status, and the child and dependent care credit. Most taxpayers with children take advantage of two or more of these tax provisions, and confusion is unavoidable when a child may be a qualifying child under one provision but not another. Taxes and tax provisions can change taxpayer behavior by introducing incentives or disincentives. The EITC and CTC affect the monetary rewards to working and having children. By affecting the after-tax wage rate, these tax credits can affect labor supply or work effort, although the effect is theoretically ambiguous. A higher after-tax wage (due to, say, a tax reduction) increases the price of leisure. This would lead an individual to take (or purchase) less leisure, or work more. This is known as the substitution effect.9 But a higher after-tax wage increases income, which would lead an individual to take more leisure or work less. This is known as the income effect.10 The total effect on labor supply of a change in the after-tax wage is the sum of the substitution and income effects, which have opposite impacts on labor supply. Consequently, the total effect is ambiguous. The after-tax wage rate for working one more hour is the hourly wage multiplied by one minus the marginal tax rate. For most workers, the marginal income tax rate is either 10 percent, 15 percent, or 25 percent. But the EITC and CTC change the marginal tax rate that a worker faces. 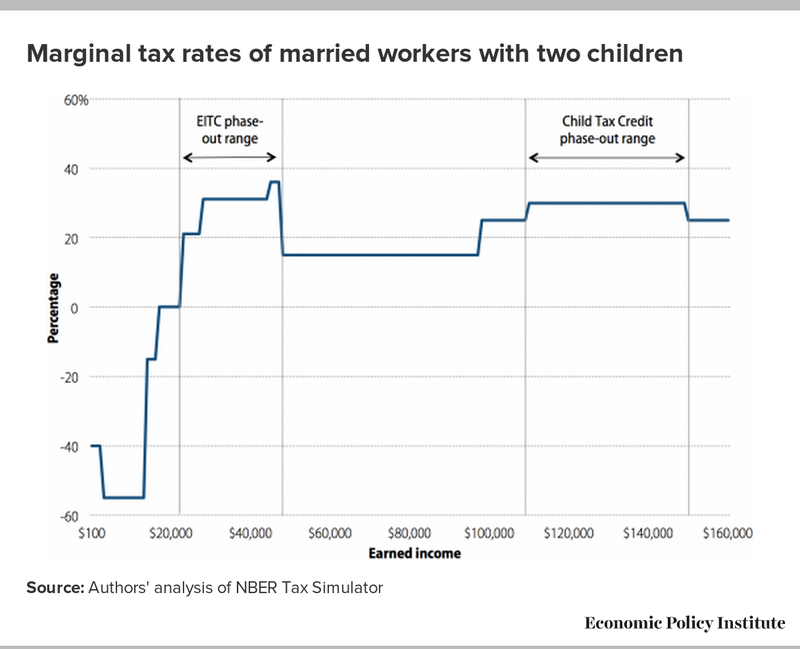 Figure A shows the marginal tax rate of married workers with two children as annual earnings increase. The marginal tax rate varies from minus 55 percent as the tax credits phase in to plus 36 percent as the EITC phases out. In the phase-in range, the after-tax wage is 55 percent higher than the before-tax wage rate, which provides an incentive to increase labor supply (either to begin working or work more hours). In the phase-out range, the after-tax wage rate is 36 percent lower than the before-tax wage rate and provides an incentive to work less (that is, reduce labor supply). Since its inception, numerous studies have examined the labor supply effects of the earned income tax credit (reviewed in Hotz and Scholz 2003; Eissa and Hoynes 2006a; and Meyer 2010). Most studies focus on single mothers and find that the EITC increases labor force participation (that is, induces single mothers to find a job). But for those already working, there is mixed evidence that the EITC significantly affects the number of hours worked. Chetty, Friedman, and Saez (forthcoming) find that workers with children increase their hours of work in the EITC phase-in range, but do not substantially change their hours in the phase-out range. This suggests that the high marginal tax rates associated with the EITC phase out have limited work disincentive effects. A few studies examine the EITC and the labor supply of married taxpayers. Since the EITC depends on family earnings, the EITC could have different effects on the primary wage earner and the secondary wage earner.11 Among married women who are already working, the EITC appears to have little effect on labor force participation (in the phase-in range) and a small negative effect on the hours worked (in the phase-out range) (Eissa and Hoynes 2006b; Heim 2010). Overall, this research indicates that the EITC has a positive labor supply effect; it increases labor force participation with little or no effect on hours worked. The high marginal tax rate in the EITC phase-out range has no apparent effect on labor supply. This could be due to most taxpayers taking the EITC as a lump-sum tax refund, workers being unaware of the EITC tax consequences when making labor market decisions, and/or institutional labor market constraints (for example, work hours are often fixed by the employer). Additionally, the credits affect the annual tax savings of a child and thus the “cost” of a child. 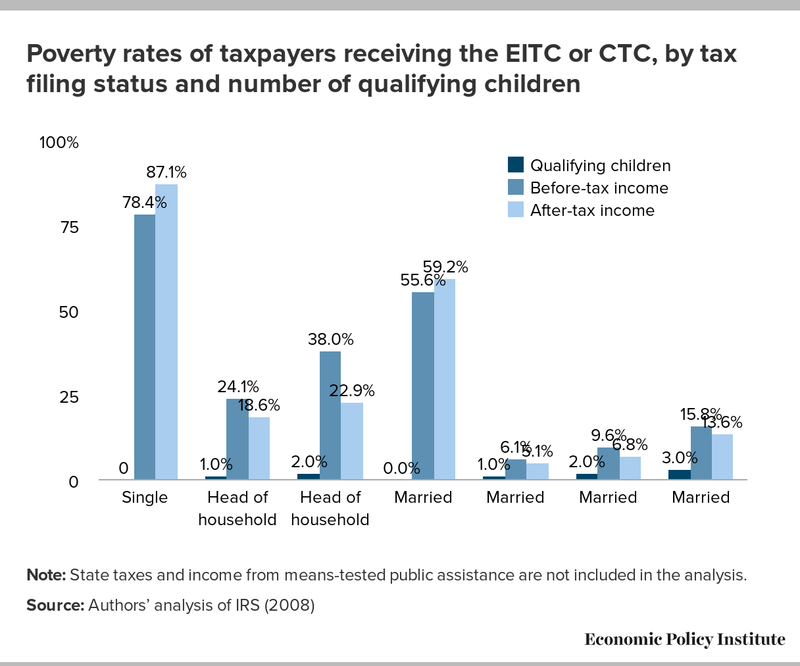 In theory, the EITC and CTC could affect marriage (through marriage penalties and bonuses) and fertility decisions. Most research that has examined the tax effects on marriage conclude that the tax credits have not affected marriage patterns (reviewed in Hotz and Scholz 2003). Evidence suggests that the tax credits, however, may have small positive incentive effects on fertility (reviewed in Hotz and Scholz 2003). The two tax credits are designed to increase the after-tax income of low- and moderate-income individuals and families, especially those with children. Since the credits redistribute income, they can be judged on their effect on poverty, tax progressivity, and after-tax income inequality. These tax credits can be thought of as government transfers, part of which is used to pay income tax liability (the nonrefundable part) and the rest available for consumption or saving (the refundable part). Adding the amount of the EITC and CTC to family income reduced the number of people in poverty by almost six million in 2011 (according to the authors’ analysis of March 2012 Current Population Survey data). Over half of the individuals moved above the poverty threshold were children. Note: State taxes and income from means-tested public assistance are not included in the analysis. As would be expected given the effect on poverty, the tax benefits of the credits are progressively distributed, as measured by the Suits index. The Suits index is a measure of progressivity that ranges from -1 (completely regressive) to +1 (completely progressive). The Suits index is negative if the benefits are predominately received by taxpayers in the upper part of the income distribution. It is positive if the benefits are predominately received by those in the lower part of the distribution. The estimated Suits index for the EITC is 0.87, which is highly progressive (Hungerford 2006). The estimated Suits index for the child tax credit is 0.28—less progressive than the EITC, but still progressive (Hungerford 2006). The effect on income inequality can be measured by the Gini coefficient, which varies from 0 to 1. A Gini coefficient of 0 indicates that income is evenly distributed among the population (that is, everyone has the same income), while a value of 1 indicates perfect income inequality (that is, one individual has all the income). The EITC reduces the Gini coefficient by 0.34 percent, and the CTC reduces it by 0.61 percent (Hungerford 2010), indicating that the credits help to reduce income inequality. A number of different proposals offer recommendations on how the EITC and CTC could be reformed and improved. The proposals try to correct one or more of the credits’ undesirable features: complexity, unequal treatment based on marital status, and the high marginal tax rates as the credits phase out. Some of the key provisions to address the drawbacks of the two credits are discussed. Selected proposals are described below, including those put forth by the Economic Policy Institute in its budget proposal, Investing in America’s Economy (Bivens et al. 2012a), as well as those recommended by various policy groups and included in recent congressional bills. One vein of policy proposals would create two tax credits—a family credit and a work credit—by combining several work- and family-related tax provisions, such as the standard deduction, personal exemptions, the EITC, and the CTC. The family credit would combine the standard deduction, personal exemptions, head of household filing status, and the nonrefundable part of the CTC. The work credit would be based on earnings. This proposal would simplify the tax code by combining overlapping provisions that have different rules. Furthermore, the tax benefits would not depend on a taxpayer’s tax bracket. Since the two credits would be available to all taxpayers with no phase out, any work disincentive would be avoided. Many different proposals exist for reforming and improving both the EITC and the CTC. What follows is a look at some of those reforms, in chronological order. In 2005, President Bush created an advisory panel to recommend options to simplify the tax code, as well as make it fairer and more conducive to economic growth. The panel proposed a sweeping consolidation of tax credits, combining the standard deduction, personal exemptions, child tax credit, an additional child tax credit, 10 percent bracket, and the EITC into a work credit and a family credit (President’s Advisory Panel on Tax Reform 2005). The family credit available to workers would be $3,300 for married couples, $2,800 for unmarried taxpayers with children, $1,650 for unmarried taxpayers, and an $1,150 credit for dependent workers, a $1,500 credit for each additional child, and a $500 credit for each additional dependent. The EITC would be replaced with a work credit, the maximum amount of which would be $3,570 for a working family with one child and $5,800 for a working family with two or more children. The purpose of consolidating the existing exemptions and credits into a family credit and a work credit was to replicate—but not improve upon—the existing distribution of tax burdens while greatly simplifying the tax structure and improving the compliance of refundable credits. Jason Furman (2006) also looked into issues surrounding the EITC, ultimately using the suggestions of the President’s Advisory Panel as a base for his reform ideas. First, however, he noted the benefits of increasing the EITC for families with three or more children—a policy that currently exists though is scheduled to expire in 2017. Furman noted that expanding the EITC for families with at least three children would be a well-targeted policy that would benefit about three million families, and stated that these families are among those most likely to be in poverty. Furman would also expand the EITC for childless workers, doubling the credit to cover all payroll taxes and allowing it on earnings up to $8,080 (the same threshold for families with one child). His reform would begin the phase out at $10,000 for singles and $10,000 plus a marriage adjustment for couples. The marriage adjustment would help reduce the EITC marriage penalty, and it would do so by increasing the starting point for the phase-out of the EITC for married couples by $3,000. He calculated (in 2006) that beginning this policy in tax year 2008 would have reduced the marriage penalty by $632 for a family in the phase-out range, and would have provided a tax cut of about $400 to roughly three million married couples, at a total cost of about $1.2 billion annually. Additionally, Furman discusses an alternative approach to reforming the EITC: the consolidation of existing child tax benefits into one unified credit, much like what both Cherry and Sawicky (2000) and the President’s Advisory Panel on Tax Reform (2005) propose. He suggests building on the Advisory Panel’s recommendations while incorporating the expansions previously discussed and also maintaining the distinction between the standard deduction and itemized deductions. Specifically, Furman proposes eliminating the dependent exemption and replacing it with a child tax credit of $1,500; that credit would be phased out for married couples starting at $200,000. The child tax credit would be refundable up to 34 percent of earnings for someone with one child, and up to 50 percent of earnings for someone with three or more children. He suggests that a separate work credit would be based on this framework, and include a childless EITC. Finally, he calculates that the implementation of such a framework would reduce revenues by less than $10 billion annually relative to current law, while including more incentives to work, reducing the marriage penalty, and reducing poverty for larger families. In 2010, President Obama created the bipartisan National Commission on Fiscal Responsibility and Reform to address the nation’s perceived fiscal challenges. While the Fiscal Commission did not propose reforms to the EITC or the CTC, its plan is notable for leaving in place those policies while reforming or zeroing out other parts of the tax code that provide benefits to taxpayers (largely known as tax expenditures). In fact, the plan calls for a “smaller” and “more targeted” tax code in terms of tax expenditures, yet insists that any new or reformed tax code include support for low-income workers and families on the scale of the EITC and CTC currently in place. The Bipartisan Policy Center Debt Reduction Task Force restructured provisions benefiting low-income taxpayers and families with children in its 2010 report, Restoring America’s Future. The task force’s goals were to simplify and make more progressive provisions benefiting low-income taxpayers, while also reducing complexity in the tax-filing process. The report cites a number of reasons to do so aside from simplicity, including that the EITC can both create a marriage penalty and can discourage work among those with incomes in the phase-out range. The task force proposed replacing low-income tax provisions (including the Personal Exemption for Children, the Child Tax Credit, the Earned Income Tax Credit, and the Child and Dependent Care Credit) with two separate provisions: a universal child credit and an earnings credit. The universal child credit would provide $1,600 per child, indexed to changes in the Consumer Price Index. Taxpayers would file for the credit with each additional child; thereafter, receipt of the credit would be automatic until the children reach adulthood, as long as they reside in the household and attend school. The earnings credit would be provided to working individuals through automatic adjustments made to withholding (workers with one job would need to make no subsequent adjustments upon filing a tax return). The credit would not phase out; as the Bipartisan Policy Center argues, this would avoid the marriage penalty and the work disincentive. The child credit and earnings credit would compensate families for both the loss of the credits that currently exist, as well as the impact of the “debt reduction sales tax” that they propose. Over 2012–2020, the Bipartisan Policy Center estimated that restructuring these benefits and eliminating the standard deduction and personal exemptions would cost $1.9 trillion, which would be offset by the 6.5 percent “debt reduction sales tax” that would raise more than $3 trillion over the same time period. In Investing for America’s Economy: A Budget Blueprint for Economic Recovery (2012), EPI proposes reforms to tax credits that are modeled on the Bipartisan Policy Center’s plan, described previously (Bivens et al. 2012a). EPI’s plan would simplify the tax code for low-income filers, promote upward mobility by reducing the high effective marginal tax rates faced by many families as the credits phase out, and also benefit the economy through providing high “bang-per-buck” for each dollar spent on these credits (Zandi 2011). Both the Working Families Tax Relief Act of 2013 (S. 836) and the Earned Income Tax Credit Improvement and Simplification Act of 2013 (H.R. 2116) would work to strengthen the EITC for childless workers.18 They would do so by lowering the eligibility age to 21 (it currently stands at 25), phasing in the credit more rapidly, and raising the maximum credit to $1,350. The average credit for eligible childless workers between ages 25 and 64 is currently $270, roughly one-tenth of the average credit for filers who are raising children. Additionally, the phase out for childless workers currently begins when earnings exceed $7,970—just 55 percent of earnings for a full-time, minimum-wage earner (Marr, Ruffini, and Huang 2013). By both boosting the credit and easing the eligibility requirements for childless workers, these reforms would take advantage of the EITC’s proven benefits of promoting work and alleviating poverty. A recent Center on Budget and Policy Priorities report (Marr, Ruffini, and Huang 2013) estimates that such a reform package, as put forward in these bills, would lift more than 300,000 childless workers out of poverty, and significantly reduce the severity of poverty for almost four million more workers. Furthermore, such an expanded credit could help meet challenges faced particularly by younger, less-educated people. These include low labor force participation rates, low marriage rates, and even high incarceration rates. While H.R. 2116 would only extend the new benefits to those who are not students, the bills are similar in that they would lower the eligibility age for childless workers, raise the earnings level at which the credit is fully phased in from $6,370 to $8,820, and would raise the income level for the beginning of the credit phase out from $7,970 to $10,425 (Marr, Ruffini, and Huang 2013). Additionally, the credit would phase down at a 15.3 percent rate and phase out entirely at $19,245 (133 percent of full-time earnings at minimum wage). S. 836 would also make the $3,000 income threshold for the CTC permanent, eliminate the indexing of the threshold, and index the value of the maximum credit. — The authors would like to thank David Harris, Monique Morrissey, and Maxim Shevdov for comments on a previous draft. Funding from the Peter G. Peterson Foundation is gratefully acknowledged. Rebecca Thiess joined the Economic Policy Institute in 2010 as a federal budget policy analyst. Her areas of research include federal budget and tax policy, retirement security, and public investment. She has a master’s degree in public policy from Duke University and a B.A. in urban and environmental policy from Occidental College. 1. See Cook (2013) for a media report about these recent attacks. 3. If the tax credit were not refundable, then this taxpayer’s tax liability would be reduced to zero, and he would receive no tax refund. 4. The Family Assistance Plan was a negative income tax for families and would have replaced the welfare system, which primarily was Aid to Families with Dependent Children (AFDC). Only families with unmarried children under age 18 (age 21 if in school) would have been eligible for the benefit (a maximum of $1,600 for a family of four). See Lampman (1969) for a discussion of FAP. 6. Personal exemptions are phased out as income rises for taxpayers with income over $200,000 (single) or $250,000 (married). 7. Single taxpayers or married taxpayers with no dependents claiming the EITC may file Form 1040EZ. 8. In comparison, Form 1040 in 1945 was a single-page, nine-line form for most taxpayers. The instruction booklet was four pages. 9. The substitution effect of a price change is the change in demand for the good when relative prices change, holding utility constant (i.e., assuming income is adjusted so as to maintain the consumer’s pre–price change utility). See, for example, Deaton and Muellbauer (1980). 10. The income effect is the change in demand for the good allowing for the change in utility due to the income change, holding relative prices at the new level. 11. It is often difficult to determine who is the primary wage earner and who is the secondary wage earner in a dual-worker household. 12. State taxes are ignored, but employees’ share of payroll taxes is included. Income from public means-tested transfers is not considered in the analysis. The poverty thresholds used are the weighted average thresholds computed by the Census Bureau; these thresholds reflect family size but not composition. Taxpayers who can be claimed as a dependent on another’s tax return are excluded from the analysis. 13. While the poverty rate is reduced, the poverty gap (the gap between the poverty threshold and income) for some of those remaining in poverty actually increases. 14. Yin and Forman (1993) suggest eliminating the EITC and introducing an exemption from the employee portion of payroll taxes. This would apply to all workers (thus benefiting childless workers to the same extent as workers with children), would eliminate the high marginal tax rate associated with the EITC phase out, and would eliminate the complexity of the current EITC. However, payroll tax revenues to the Social Security and Medicare trust funds would be reduced. 15. Since their paper was published, the EITC has been modified. The Economic Growth and Tax Relief Reconciliation Act (EGTRRA) of 2001 raised the income level at which the credit begins to phase out for couples to $3,000, and the American Recovery and Reinvestment Act (ARRA) increased that amount to $5,000 (and indexed it to inflation). The Tax Relief Unemployment Insurance Reauthorization and Job Creation Act of 2010 extended the provisions passed under ARRA through 2012, and the American Taxpayer Relief Act of 2012 extended those provisions again through 2017, and also made permanent the increase passed under EGTRRA (Tax Policy Center 2013). 16. At the time of the proposal, this was the tax benefit of the exemption and CTC for taxpayers in the 28 percent bracket. 17. This score was provided to the Economic Policy Institute from the Tax Policy Center in its analysis of EPI’s policy proposals submitted for the Peterson Foundation’s Fiscal Solutions Initiative II. This score includes the elimination of the standard deduction, personal exemption, EITC, CTC, CDCC, child care exclusion, and education preferences. 18. A single and childless full-time worker earning the minimum wage is ineligible to receive the EITC due to the fact that his or her earnings exceed the income limit for the credit provided to workers without children. Chetty, Raj, John N. Friedman, and Emmanuel Saez. Forthcoming. “Using Differences in Knowledge Across Neighborhoods to Uncover the Impacts of the EITC on Earnings.” American Economic Review. Cronin, Julie-Anne, Portia DeFilippes, and Emily Y. Lin. 2012. “Effects of Adjusting Distribution Tables for Family Size.” National Tax Journal, vol. 65, no. 4, 739–758. Deaton, Angus, and John Muellbauer. 1980. Economics and Consumer Behavior. Cambridge: Cambridge University Press. Eissa, Nada, and Hilary W. Hoynes. 2006a. “Behavioral Responses to Taxes: Lessons from the EITC and Labor Supply.” In Tax Policy and the Economy, Volume 20, edited by James M. Poterba. Cambridge, Mass. : MIT Press. Eissa, Nada, and Hilary W. Hoynes. 2006b. “The Hours of Work Response of Married Couples: Taxes and the Earned Income Tax Credit.” In Tax Policy and Labor Market Performance, edited by Jonas Agell and Peter Birch Sorensen. Cambridge, Mass. : MIT Press. Furman, Jason. 2006. Tax Reform and Poverty. Center on Budget and Policy Priorities. http://www.cbpp.org/cms/index.cfm?fa=view&id=134. Gravelle, Jane, and Jennifer Gravelle. 2006. “Horizontal Equity and Family Tax Treatment: The Orphan Child of Tax Policy.” National Tax Journal, vol. 59, no. 3, 631–649. Heim, Bradley T. 2010. The Impact of the Earned Income Tax Credit on the Labor Supply of Married Couples: A Structural Estimation. Indiana University working paper. Hoffman, Saul D., and Lawrence S. Seidman. 1990. The Earned Income Tax Credit: Antipoverty Effectiveness and Labor Market Effects. Kalamazoo, Mich.: W.E. Upjohn Institute. Hotz, V. Joseph, and John Karl Scholz. 2003. “The Earned Income Tax Credit.” In Means-Tested Transfer Programs in the U.S., edited by Robert Moffitt. Chicago: University of Chicago Press. Hungerford, Thomas L. 2006. “Tax Expenditures: Good, Bad, or Ugly?” Tax Notes, vol. 113, no. 4, 325–334. Hungerford, Thomas L. 2010. “The Redistributive Effect of Selected Federal Transfer and Tax Provisions.” Public Finance Review, vol. 38, no. 4, 450–472. Internal Revenue Service (IRS). 2008. “Statistics of Income Public Use File” [data tables]. Internal Revenue Service (IRS). 2013. 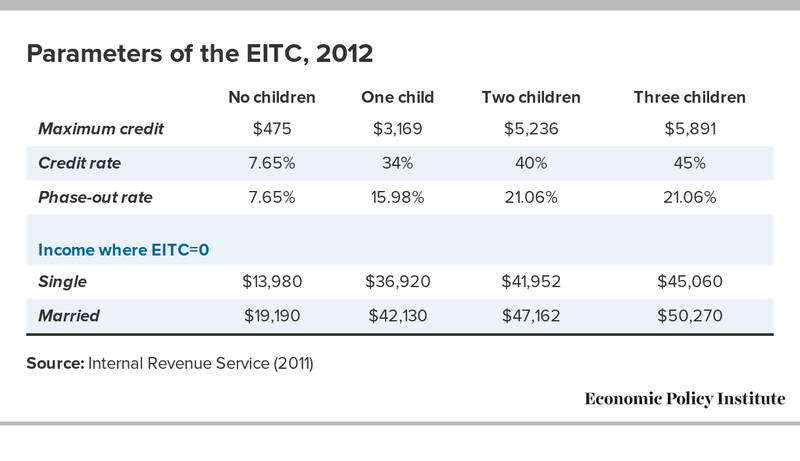 “Tax Year 2012 Child-Related Tax Benefits Comparison.” http://www.eitc.irs.gov/public/site_files/crtbcchartv5.doc. Joint Committee on Taxation. 1997. General Explanation of Tax Legislation Enacted in 1997. Joint Committee on Taxation. 2013. Estimates of Federal Tax Expenditures for Fiscal Years 2012-2017 (JCS-1-13). Lampman, Robert J. 1969. Nixon’s Family Assistance Plan. University of Wisconsin, Institute for Research on Poverty, Discussion Paper 57-69. McCubbin, Janet. 2000. “EITC Noncompliance: The Determinants of the Misreporting of Children.” National Tax Journal, vol. 53, no. 4, 1135–1164. Meyer, Bruce D. 2010. “The Effects of the Earned Income Tax Credit and Recent Reform.” In Tax Policy and the Economy, Volume 24, edited by Jeffrey R. Brown. Chicago: University of Chicago Press. National Commission on Children. 1991. Beyond Rhetoric: A New American Agenda for Children and Families. National Commission on Fiscal Responsibility and Reform. 2010. The Moment of Truth: Report of the National Commission on Fiscal Responsibility and Reform. http://www.fiscalcommission.gov/news/moment-truth-report-national-commission-fiscal-responsibility-and-reform. Smith, Adam. 1776. The Wealth of Nations (1937 Cannan edition). New York: The Modern Library. Steuerle, C. Eugene. 2004. Contemporary U.S. Tax Policy. Washington, D.C.: Urban Institute Press. Treasury Inspector General for Tax Administration (U.S. Department of the Treasury). 2013. “The Internal Revenue Service Was Not in Compliance With All Requirements of the Improper Payments Elimination and Recovery Act for Fiscal Year 2012” (reference number 2013-40-024). Ventry, Dennis J. 2000. “The Collision of Tax and Welfare Politics: The Political History of the Earned Income Tax Credit, 1969-99.” National Tax Journal, vol. 53, no. 4, 983–1026. Yin, George K., and Jonathan Barry Forman. 1993. “Redesigning the Earned Income Tax Credit Program to Provide More Effective Assistance for the Working Poor.” Tax Notes, May 17, 951–960.